Few are those who know that the actual community center from the Foeni commune (Timiş County) was once part of the five residences belonging to the Mocioni family of Banat. Built in 1750, the Mocioni family mansion from Foeni is one of the oldest buildings from the land of Banat. Unfortunately, just like most of the old noble residences from the region, this historical monument is in an advanced state of degradation and, over the years, its architecture has been altered several times. The story of the Foeni village starts as early as the roman period, when the Bacucis Camp was here. The first documented mentioning dates to 1289, when King Ladislau III convened a Legislative Assembly at Föen. In 1400, Foeni appears to belong to the Chaak (or Ksaky/Ksaki) Hungarian Family. In the Middle Ages, it was part of the Timis Committee and during the Habsburgic and Austro-Hungarian administrations, it was assigned to the Torontal Committee1)Samu Borovszky – Monografia Comitatului Torontal, 1912. In 1912, there were 2041 souls that lived here (out of which 238 were hungarians, 506 serbians and 1297 romanians) and there were 375 house numbers, a post office, telegraph and train station. 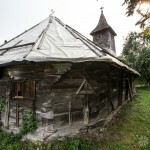 The Orthodox church was built in 1882. Six years later, in 1888, a Serbian church is also built2)Samu Borovszky – Monografia Comitatului Torontal, 1912. According to the “Anuarul Socec al României Mari”, between 1924 and 1925, the total number of the Foeni population was 1791. Currently, Foeni is the headquarters of the commune that bears the same name and that also includes Cruceni, a village settled in the 17th century by German colonists. The two villages together have a number of 1737 locals. The Foeni commune had a significant role in the history of the Mocioni Macedo-Romanian family, whose members have been politicians, scholars or philosophers. They occupied high functions and they were related with the Hungarian nobility, but always fought for the emancipation and the rights of the Romanian people from Banat and Transylvania, from both a political and cultural aspect. They were originally from Tessalia, where their main occupation was the raising of sheep and the valorification of products obtained from these animals, the products being sold to the furthest commercial corners of the Ottoman Empire. The main figures that topped the family tree of the family were Petru and Constantin Mocioni, who, in 1690, followed the great migration of the Arsenie Patriarch. Petre dies in the Battle from Zenta (1697), in the army of Eugeniu de Savoya, and Constantin Mocioni, alias Popovicz, becomes priest of the Orthodox community from Pesta (1747). He lived for 110 years and had 5 children, out of which only three are remembered: Mihaiu, Andrei and Petru. The last one died in 1775, didn’t have any successors and left all of his wealth to Andrei. Both of them working in commerce and finance, Andrei and Mihaiu divide the family into two branches: one at Pesta and the other one at Miskolc and Tokaj, in the north of Hungary. In 1780, Andrei asks and receives from Emperor Joseph II the Foeni estate, from this resulting the “Foen” line. Andrei Mocioni de Foen, Countess Ecaterina de Mocioni, Antoniu Mocioni de Foen, Eugen de Mocioni, Zeno de Mocioni, Petru de Mocioni, Ioan I. Mocioni-Stârcea (the son of Ioan Stârcea, who came from a landowner family, and which was adopted in the year 1925, by the baron Anton Mocioni de Foen) and, especially, Alexandru de Mocioni, are among the most important of the Mocioni family members. 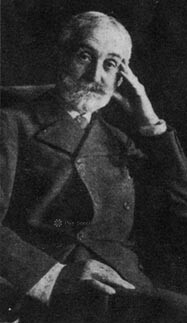 A lot of the Mocioni members have refused the Emperor’s offer for ennoblement, because they considered themselves to be romanians and prefered to spend their fortunes on the creation and support of a political class capable of dedicating itself to the national and social emancipation. 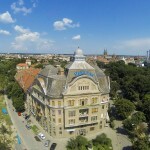 Just during the 1865-1866 school year, the family was supporting 36 students through scholarships at the Universities of Budapest and Vienna, at the Beautiful Art Academy of Rome, at the Oradea and Debrecen Academies and in the Banat high schools. Among these students there were also Victor Babeş and Coriolan Brediceanu7)Maria Berényi – Centenar – Alexandru Mocioni (1841–1909), Revista Lumina 2009, pag. 3-4. The current community center of Foeni was, until not long ago, one of the Mocioni residences and the place where the Foen family branch developed. The mansion, located right in the middle of the commune, was built in 1750, in a neoclassic style and is one of the oldest buildings of Banat, just like the Count Mercy Castle from Carani (1734). During the 1848 Revolution, the imposing building from Foeni was almost entirely destroyed. The most important member of the noble family that lives here was Andrei Mocioni of Foen, the grandson of Constantin, the Aromanian priest. 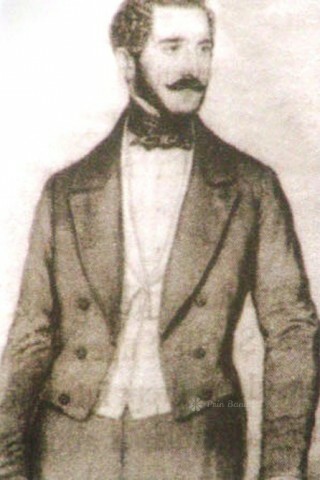 Andrei was born in Budapest, in 1812. Lawyer by profession, member of the Vienna Imperial Senate, founding member of Romanian Astra (1866) and honorary member of the Romanian Academic Society (1870), over the course of his career he was dedicated to the fight for the rights of Romanians from Banat and Transylvania. In 1869, he inherits the Foeni estate, retires from the political life and settles into the mansion, along with his wife, Laura Cernovici. He died on April 24 1880 and leaved his fortune to Laura, act that started a wave of complaints in the Mocioni family. In turn, Laura left the mansion as inheritance for one of her nephews. 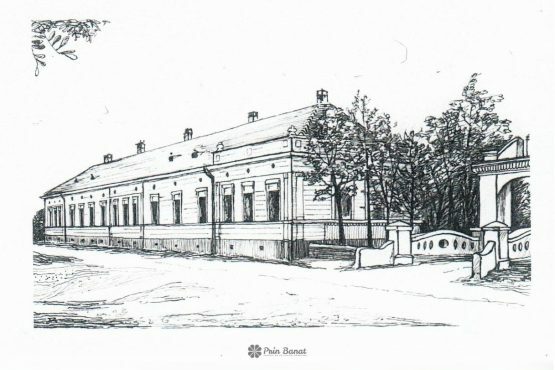 Therefore, in 1912, owner of the old Mocioni residence was the baron Csávossy Gyula. In 1925, landowners in Foeni were Joseph and Andres Csávossy, with 2334 “jugăre” (unit of measurement for agricultural lands) and Antoniu Mocioni de Foen (the great chamberlain of King Carol II), with 1722 “jugăre”. The mansion was bought back by Anton, who tried to turn it into a community center, but he died in 1943, along with the direct line of the Mocioni family. With the installment of the communist regime, the property was nationalized. It functioned for a few years as a public bath and day care center. After ‘89, the mansion is left to the local administration and it is transformed into a community center, function which remains to this day. The building is found on the Timiş County Historical Monuments List. There is no relevant document! Our guide for the Mocioni of Foeni was mister Valerică Borlovan, who is also the man in charge of the public library that works inside the community center. Originally from Foeni, he is divided between the third functions: librarian with functions of cultural secretary, SVSU chief (the Emergency Situations Inspectorate) and both volunteer and collaborator for the Red Cross – the Timis branch. 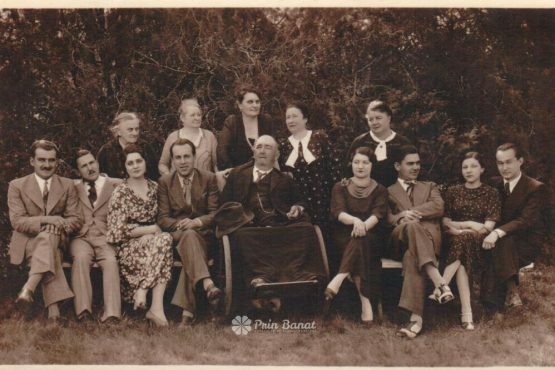 On a wall in the library there is a panel with photographs of the Mocioni family members, which were out of Teodor Botiş’s book, the man who wrote the only monograph of this Aromanian family. Even though he would spend his time around the mansion, mister Valerica doesn’t remember too much about how it was before 1989, but now he is searching for documents, at least to have what to tell to those who come and visit the old noble residence. There is no relevant document! I can’t even say that I have the home’s blueprint. I went to the archive (of the city hall), I even got sick there. I had to go and get treatment for my lungs, and I still couldn’t find it. That was the reason for which I looked through the entire archive. For two weeks I took every document by hand and checked it. 50 years have passed since I went to kindergarten here. It was a kindergarten with extended hours and we used to sleep here. But I can’t even remember through which door we would enter and through which door we would leave. After the ‘50s and after it was destroyed by the hungarians, it was passed on to the state. The communists turned it into a public bath, kindergarten and community center. From what I read, for a while it even hosted a sanatorium. I caught it when it became a community center. I didn’t work here, maybe that would have given me an idea (about how the inside was organized). But, how it was, someone stayed here for two months, someone else for ten, and they all found a way to destroy it…Rarely were there people like me, to stay here for seven-eight years and not be interested in anything but constructing, gathering, recovering and maintaining. He desperately tries to involve the Foeni youngsters in as many activities as possible. From the maintenance of the community center to the organizing of events, literature contests, traditional wear contests or banat speech contests and even activities and trainings for the Red Cross, everything done along with and for the children of the commune. After ‘90 and until ’96, it was a disco. After that they woke up and decided that it’s a historical monument and that the disco should not be allowed to function anymore. Mister Valerică led us through all the corners of the Mocioni mansion. He even took us to the attic and basement. He knows from the elders that, when the building was built, all the people from Foeni got involved: It is said that from there, from the back of my house, from there and until here, the brick was passed from hand to hand. The communists, on the other hand, used the bridge to deposit cereal: They had, on one side, an elevator that was used to get them up, and that was one of the reasons why they built the bridge out of concrete, for cereals. Don’t think that this was made out of concrete from the beginning, in the time of the Mocioni family (laughs). The entire time during the communist regime, in the east wing of the mansion’s basement, a gym was organized. Mister Valerică remembers that, between 1974 and 1975, he came along with the school to help building the concrete ventilation windows. We had a gym here. There was a door through which you could pass on the other side. Because of how they plastered the wall you can’t see it anymore. After ‘90 until ‘96, this was a disco. After that they woke up and decided that it’s a historical monument and that the disco should not be allowed to function anymore. The door through which the old gym/disco used to connect with the rest of the rooms in the basement can be seen in the west wing, that has, also, a separate entrance from the mansion courtyard. Even though outside were over 20 degrees, the temperature in the building basement was clearly lower. The air was humid and hard to take in, and the only lighting sources were a few lanterns. I’m the only one who walks around here, but I still don’t have the courage to walk around the basement without a lantern. The basement has the same structure that the mansion had. In 2005, after the floods, they asked us to break it. They keep measuring it, digging in it. We kept digging for almost a meter or more, we even forgot about that hole. I entered the basement one day and I fell in it, like I didn’t knew that it was there, it completely slipped my mind. Mister Valerică suspects that, during the time of the Mocioni family, the servants bedrooms and kitchens functioned in the basement. Here is where the servants lived during their time (the Mocioni family). During the communist regime it was the public bath. All the layers of paint can be seen. The blue one was one of the first. Here you can still see how the bathroom pipes looked like. The bakery was also here. This is the bakery oven. Here there was a door, but they covered it. It is said that here is where the servants used to live. That’s what I know, that this oven is from that time. The communists, after shutting down the public bath, they used the basement as a deposit. Just the mechanics were kept here. The vegetables were kept outside, for the cows. They also stored herbicides and pesticides. There was even a siphoning station here. We can go back now, the way we came. Just make sure that we don’t get lost, that we don’t wake up… A moment of silence followed, after which, mister Valerică told us with nostalgia in his voice: How would you call this: the Mocioni Family Mansion! Others would like to have as much history as we do! Many events from the recent history of the Foeni commune and the Mocioni Mansion have as a reference the 2005 floods. You have your age, I have my age, but I ask you: what else is respected in this country? Maybe it was both good and bad luck with the 200 floors, because after that they installed the PVC windows. The interesting part is that the kindergarten ones were installed in 2006. They were supposed to return and install in this part too. In 2006 they came and said: “No, it’s a historical monument and we cant ruin its appearance…” But these weren’t the original ones (the windows). Here, the window structure was not like this. The original windows were not straight, but round with arches. In ‘87-’88, the fireplace caught on fire. They did what they could, what they wanted, to repair it back then. In 2007-2008 they installed the PVC windows. After the floors, they wanted to bring some workers here, I don’t know what they wanted to do, to live here? After the floods, we thought that they will repair it, but no, we were dead wrong. I struggled to gather the elders here, to have an open discussion with them, so that they can all say something about the customs, clothes and language. I wanted a project regarding these. But no. I even went to the Octavian Goga memorial house, there are twelve things there, but they’re interesting! They could have done the same thing here! Here you would have much more to see! Others would like to have as much history as we do! In the Foeni cemetery there is a historical monument, represented through the Mocioni family mausoleum. Inside, on a granite plaque it is written that the mausoleum was built by Zeno Mocioni and his grandkids, Alexandru and Eugeniu, at the encouragement of Antoniu of Mocioni of Foen. The monument was constructed after the plan of the architect Maurit Kallina from Budapest, in 1900. Here were buried both Andrei Mocioni, Alexandru Mocioni as well as Antoniu Mocioni of Foeni. The Foeni commune is 43 km away from Timisoara (see map). Besides the mansion and the mausoleum of the Mocioni family, in Foeni you can also see another historic monument, right near the cemetery, at the exit towards Cruceni: the Turkish stone bridge, which was built in 1749. Also, in the same area, you can also visit the cereal deposit of Giera, the Gudenus Mansion of Gad or the mausoleum-church of Bobda, which belonged to the Csávossy baron. 2 comments at "The Mocioni mansion of Foeni"